Better seats make the SE the place we think many shoppers should start. The Toyota Camry is America's best-selling car in a competitive segment that includes strong entries such as the Honda Accord, Ford Fusion, Hyundai Sonata, and Subaru Legacy. The Camry was most recently overhauled in 2015, and this year's model carries over largely unchanged. It's a a comfortable commuter without much pretension; a very good appliance for car buyers who prefer substance over style. From the exterior, the Camry looks largely reserved with brief flashes of bold styling. Most notably, its "mechanical catfish" grille returns from last year and could be the car's most polarizing statement. It's unusually bold for Toyota and something that may not turn off many buyers from considering a Camry, but almost certainly won't turn many on. Around the sides and rear, the Camry is handsome without overstating or relying on modern language like a floating roof or a too-high window line. Under the hood, most buyers will find a modest 2.5-liter inline-4 that makes 178 horsepower, which is the base powerplant. That engine is mated to a conventional 6-speed automatic (many competitors now use continuously variable transmissions) that helps wring out the best from the busy 4-cylinder. The engine isn't overwhelming, but it should be fine for most commuters. A more potent 3.5-liter V-6 that makes 268 hp and a hybrid battery-engine combo that makes 200 hp are both available here. The V-6 has enough pedal to be confident anywhere; the hybrid returns a stratospheric 40 mpg combined. Inside is where the Camry comes alive. Its interior is spacious and considerate, with plenty of interior storage and sound-deadening, and places a premium on seating for adults—perhaps at a cost of versatility and cargo storage. Its 15.4 cubic feet of trunk space is in line with the rest of the segment, and isn't heavily compromised by batteries if buyers opt for the Camry Hybrid. The Camry performs well in safety tests, but not as good as others in its class. Federal officials have given it a five-star overall rating, despite four-star ratings in side impact and rollover crash safety. The IIHS gave the 2017 Camry its most prestigious Top Safety Pick+ award after it aced all of their tests and its optional forward-collision mitigation technology was rated as "Advanced." The 2017 Camry comes equipped as standard with mostly acceptable features for cars in its class, but adds a 6.1-inch touchscreen on base models—above-average in our books. The Camry comes in two flavors with different looks: LE and XLE models are plain-clothes models with more luxurious touches to the latter; SE and XSE are sportier-looking variants with the XSE more handsomely equipped. In hybrid configuration, the Camry can be very fuel efficient. The base inline-4 and optional V-6 engines aren't very advanced when it comes to fuel-saving features. The mid-size mechanical catfish keeps the same look this year; thankfully it's not as offensive as the Corolla. Restyled in 2015, the 2017 Toyota Camry is a handsome mid-sizer with brief flashes of courage. 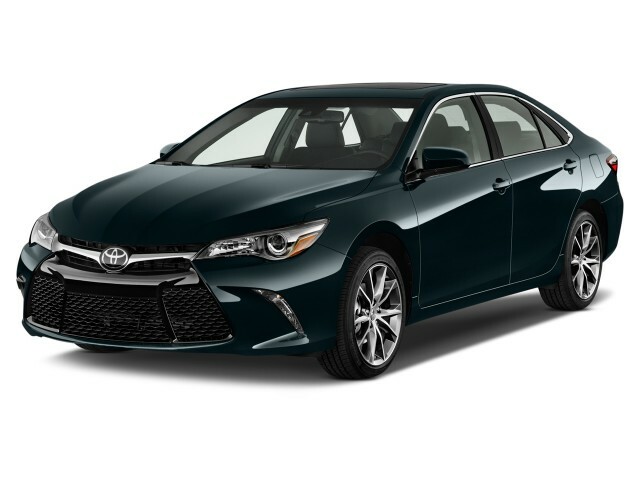 The Camry sports a wide track, thin upper grille, and large lower maw that gets wider toward its jowls; a wide-open catfish look that is especially pronounced in lighter colors. It's bold, without being too off-putting. The Camry doesn't resort to dramatically dropping rooflines or blacked out pillars to stand out; the only detail we'd lose is the glossy black plastic forced behind the rear windows. We're unclear if designers were looking to extend the shape of the greenhouse in the car's profile, but the effect looks somewhat low-rent when viewed up close. The headlights are swept back with clear lenses and nice detailing, and upper trims get handsome LED daytime running lamps. Along the sides, there’s a character line that slopes down from the rear toward the front wheels. The side sheet metal flows front to rear, ending with a lip spoiler on SE and XSE models. At the rear, there’s a curved bar of brightwork that turns down to partially frame the taillights. The Camry LE comes equipped as standard with cloth seats, and suede-like material comes on SE models. XLE editions step up to leather and XSE models have sport leather ultrasuede upholstery. Most models get a 6.1-inch touchscreen front and center as base, while V-6 models are upgraded to a 7.0-inch touchscreen, and the center stack has large knobs and buttons. The dash is also accented by stitching to add both texture and eye appeal. Toyota's Camry is the perfect appliance for daily commutes in base configuration; its amply powered V-6 is somewhat of an outlier. The 2017 Toyota Camry keeps the same engine and transmission combinations as prior years. Most Camrys will come equipped with Toyota's modest inline-4 that produces 178 horsepower and 170 pound-feet of torque. The busy 4-cylinder isn't exactly fast, but does help the Camry reach into 30-mpg territory without batteries. Optionally equipped on XLE and XSE models, the 3.5-liter V-6 provides 268 hp and 248 lb-ft of torque, and is a large leap up in performance—and in price. The pleasure of having plenty of pedal will cost most buyers about $5,000 more than comparably equipped 4-cylinder models, or about $1,000 more than a comparably equipped hybrid. Both gasoline-only engines are mated to a smooth shifting 6-speed automatic that's practically invisible. That's not faint praise either: Toyota's 6-speed is a little sluggish kicking down a couple gears in 4-cylinder models for passes or mountain jogs, but beyond that, it's a reminder that not all mid-sizers need to have loud continuously variable transmissions (CVT). Toyota hasn't released details on the 2017 Camry Hybrid, but we expect it to be the same as last year's model, which mated the 2.5-liter inline-4 to a nickel-metal-hydride battery system borrowed from the third-generation Prius. The total system creates 200 hp, and is connected to a electronically controlled CVT. Body and suspension changes made in 2015 have added a bit more control to the Camry's driving character while maintaining a smooth ride. The body was made stronger through the addition of numerous spot welds, and Toyota gave the car stiffer spring and shock settings. The result is tighter vehicle control and a more responsive feel at low speeds while helping filter out bumps and harshness at higher speeds and in cruising. 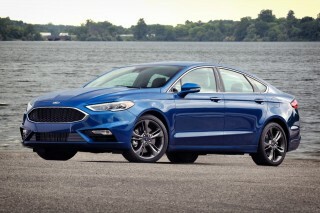 On a smoothly surfaced but violently heaving country backroad in the softest-tuned XLE, we were especially impressed by the way this plush-riding sedan soaks up the worst of it yet rebounds in a controlled way, all while avoiding the wallowing and floating of soft-riding sedans of the past. 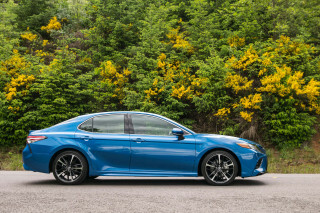 Toyota also reworked the brakes, adding a two-stage master cylinder that does away with the long pedal travel and mushy, sudden engagement at low speeds that has plagued the Camry in the past. It feels more confident, and we hope Toyota deploys this in all their vehicles. We expect Toyota will eventually add a turbocharged option to replace the aging V-6, but we don't expect it this year. Most buyers will find that the 4-cylinder is perfectly adequate, even if it's a little sluggish. The V-6 inspires confidence, but has a high price tag. Like any good after-school special tells us, it's what's on the inside of the Camry that counts. The 2017 Toyota Camry's focus is on its interior comforts, and for the most part, they don't disappoint. From the front seats, the Camry is spacious and accommodating. 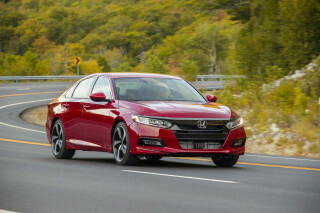 Its dash is pushed farther forward than some of its competitors, which makes the Camry's cabin feel more open and airy than say, a Honda Accord. That styling is also functional, there are plenty of interior cubbies and storage areas in the Camry. Stepping up to the sportier Camry models (SE and XSE) nets more contoured and firmer seats. We've found that the chairs don't offer much more lateral support, but they're still a snug—and better—fit compared to LE and XLE models. All trims of the 2017 Toyota Camry have 60/40-split folding rear seats, which don't completely fold flat, but there's a good reason for that. Toyota favored adult-size contouring and padding in the rear seats, which we think makes the rear more functional for carrying people—its 15.4 cubic feet of cargo space is sufficient for its class anyway. The Camry's less-than-adventurous roofline also favors adults sitting in the rear. Our tallest editor can sit comfortably in the rear seats without craning. Three adults could be a little cramped in the back, however, but that's mostly due to lack of shoulder room. With 15.4 cubic feet, the trunk has plenty of space for large suitcases or a big family's grocery run. The Camry Hybrid doesn't sacrifice rear seating comfort or much cargo room, but it does give up a little trunk space. 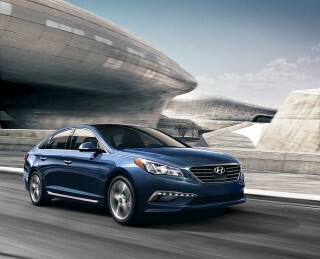 However, unless you compare it against the non-hybrid models, you might hardly know the difference. In addition to interior comfort, the interior materials help make the Camry a pleasant place in which to spend long stretches of time. You can't underestimate the psychological lift lent from the trim and materials upgrades added for 2015. Having more soft-touch surfaces up close makes the cabin feel like a more welcoming place. The dashboard also features a somewhat utilitarian design, with chunky multi-function controllers on either side of the steering wheel, positioned right where your thumbs can be. Intuitive virtual buttons on the touchscreen make it easy to choose the various controls, as do large buttons that surround the touchscreen. Toyota's Camry scores well on most tests, but not as good as other competitors in its class. The 2017 Toyota Camry has very good marks from federal testers and the IIHS. 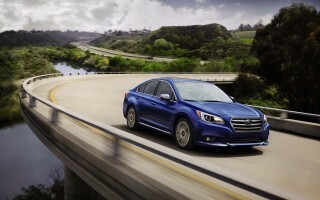 With newly available safety features, it's one of the safest sedans on the road. For 2017, federal regulators gave the car a five-star overall rating, but gave the Camry four stars in its side impact collision and rollover protection tests. The IIHS gave the Camry top "Good" scores on all crash tests, an "Acceptable" headlight rating, and an "Advanced" rating for the optional active safety features. 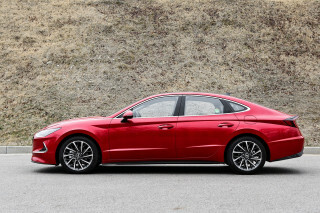 Those small blemishes put the Camry behind the Honda Accord and Subaru Legacy as the top safety picks in the mid-size segment. 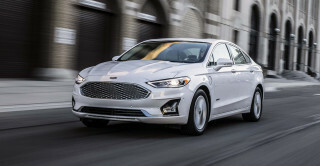 We'd prefer that the optional safety packages weren't reserved for top XSE and XLE models and not buried in other options that add more than $3,700 to the bottom line. All Camry models include 10 airbags, with front passenger knee bags and rear side airbags for outboard occupants, as well as electronic stability control, anti-lock brakes with electronic brake-force distribution, and a Smart Stop Technology brake-override system. Safety options include a blind-spot monitor with rear cross-traffic alert, adaptive cruise control, a forward-collision warning system, lane departure alert, and automatic high beams. Base Camrys are equipped with what you'd expect, higher trims get more standard equipment this year. The 2017 Toyota Camry adds standard premium audio, more technology, and navigation capabilities to higher trims as standard for this year. Pricing for the Camry has stayed the same since 2016. The Camry will be offered in four basic trims this year that start with the LE, then SE, XLE, and XSE. 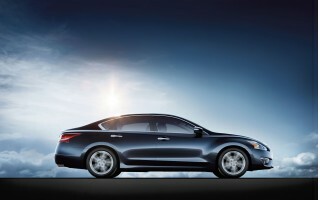 All cars come equipped the 2.5-liter inline-4 engine as standard, the 3.5-liter V-6 is an option on XLE and XSE models. The base model of the 2017 Toyota Camry comes equipped with 16-inch steel wheels, automatic projector beam headlights, power heated side mirrors, power-adjustable front seats, air conditioning, cruise control, tilt/telescoping steering wheel, power windows, keyless entry, and a rearview camera. Buyers also get the Entune 6.1-inch touchscreen audio and infotainment system with a CD player, auxiliary audio input, USB port, voice recognition, Bluetooth hands-free calling and audio streaming, and six speakers. SE models add to the LE equipment with 17-inch graphite-finish alloys, a sport suspension, black trim bezels, a color-keyed rear spoiler, chrome-tipped exhaust, smoked-chrome upper-grille and rear garnish trim, and a sport mesh front grille. Inside, they get faux leather upholstery, and a leather-trimmed steering wheel. The XSE model adds luxury equipment to the SE with sport Ultrasuede seats, dual-zone climate control, LED low and high-beam headlights, LED running lamps, and 18-inch machined alloy wheels. When equipped with the V-6, the XSE also gets a universal garage-door opener, an auto-dimming rearview mirror, vanity mirrors, reading lights, a sunroof, an acoustic windshield, and dual chrome-tipped exhaust outlets. Top XLE models retain a feature list that some might say belongs to a luxury car, as they add keyless ignition, leather seats with power lumbar support, and 17-inch Super Chrome alloys. XSE and XLE models with the 4-cylinder engine get the Entune Audio Plus system that brings Sirius satellite radio, HD radio, HD traffic and weather services, and the new smartphone navigation integration. XSE and XLE models also add Qi wireless charging as standard for this year. Not many cell phones use the standard (including Apple's iPhone), so that detail may glaze over many buyers. Equipment for 2017 Toyota Camry Hybrid models roughly parallels that of 4-cylinder Camrys of the same trim level, though the Hybrid is only offered in LE, SE, and XLE trim levels. The Camry Hybrid manages world-class efficiency numbers; the rest of the lineup aren't exactly world-beaters. Official EPA ratings for the 2017 Toyota Camry are in, and they're OK, but falling behind in the class. The thirstiest of the bunch, the V-6 equipped Camry, has been rated by the EPA for 2017 at 21 mpg city, 30 highway, 24 combined. The more common engine (although we say its a little sapped for power) is the 2.5-liter inline-4, which has been rated at 24/33/27 mpg. The Hybrid Camry is the best of the bunch: it was rated last year at 43/39/41 mpg. 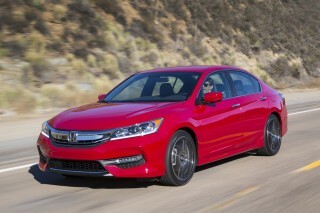 The Camry's natural competitor, the Honda Accord, manages 27/37/31 mpg with its 4-cylinder engine, 21/32/25 mpg with a V-6. 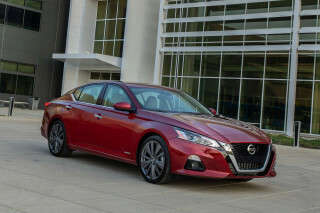 The Nissan Altima's most popular configuration manages 27/39/31 mpg. Love the paint selection of Creme Brulay (sp ?) Never shows that it needs washing. Back up camera a major must. Still Camry has no handle or indentation to close trunk. Need to have this remedied since one... Love the paint selection of Creme Brulay (sp ?) Never shows that it needs washing. Back up camera a major must. Still Camry has no handle or indentation to close trunk. Need to have this remedied since one does not want to leave oil etc from hand on paint or trim. Nice car. It rides good and good mileage. It's a good running car. I love my color looks good happy about it. Just didn't have a certain radio I wanted. Having been an 11 year owner of a Toyota corolla, I decided to upgrade to a Camry. I like the interior, I like the fuel economy. However for the price, it seems like a basic navigation system would be standard... Having been an 11 year owner of a Toyota corolla, I decided to upgrade to a Camry. I like the interior, I like the fuel economy. However for the price, it seems like a basic navigation system would be standard especially given the big built in screen on the console. A low tire pressure alarm comes on, and there is no reset button, except by adding the tire pressure, which does not automatically indicate which tire is low on pressure or returning it to the dealership for reset. This is an unnecessary inconvenience, I am experiencing buyers remorse, I might trade it in for a Honda soon.